Winter came whalloping in this week for many parts of the country, covering fall-blooming flowers with snow and bringing down the temperatures to record-breaking lows. While the winter weather seemed a long time coming this year, with it comes the need to bring the outside in with a fresh bouquet or potted plant to remind us through the short, cold days and chilly nights that spring will come again. Consider the white cyclamen for a frigid day like today. Said to represent warmth in the Victorian language of flowers, its gracefully drooping white blooms and silver-streaked leaves will warm your heart and help you not mind being cooped up in the house on these chilly winter days. While its beauty rivals any tropical, hothouse houseplant, the cyclamen is actually native to the temperate climates of Europe and the Mediterranean, where it grows along rocky coastlines, thriving once the hot summer sun sinks lower on the horizon and cooler temperature prevail. The name, cyclamen, comes from the Ancient Greek word for “circle,” in reference to the round bulb from which it grows. The leaves grow directly from the underground bulb and are held aloft on long leaf stems that open up into a heart-shaped leaf blade. The leaves of the cyclamen have interesting coloration, with a white or silver streak running through each leaf in the pattern of a maple leaf or Christmas tree on the upper side. The undersides of each leaf is often a darker purple, making this a lovely houseplant even when not in bloom. The unique flowers of the cyclamen are distinctive for their upswept petals. They can come in purple, pink and red, but the white-flowered variety are a perfect choice for a winter flower- each bloom like a falling snowflake. 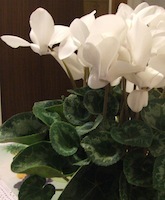 The flowers last for more than a week and most cyclamen will put out 3 to 5 flowers at a time. After the plant is finished flowering, simply cut off the spent blooms and water with your usual houseplants. A bit of fertilizer a couple of time each year will help your cyclamen re-bloom in the late fall through early spring. There are more than 20 different species of cyclamen, but the florist’s cyclamen (Cyclamen persicum) is best suited to grow as a houseplant. They prefer bright light and will do best in a sunny window, flowering just as the long nights and cold temperature of winter set in. Pick one up today (or better yet, have one delivered) for a warming winter gift to yourself or someone you love.